Comment: Used book(s) in very good condition with little wear or damage. Pages are in very good condition with little to no wear, marks or writing. Spine is in very good condition with no marks or wear. Cover shows light wear or no wear at all. I came across The Daily Stoic in Barnes and Noble one Saturday near the end of December 2017. I looked through it and liked what I saw but realized that I could not afford the hefty price tag, so I looked it up on Amazon and saw a better price, especially on my retirement budget. As I read the beginning, I realized the power of the thought provoking questions. 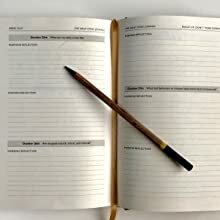 Journals are usually blank and ready for the writer's thoughts and words. But The Daily Stoic provides the questions which forces the writer in a direction probably far different from what the writer may have intended. The questions are made for reflection and then further reflection again in the evening. I am thoroughly enjoying the reflective questions that The Daily Stoic provides. Sometimes, I can answer the questions right away and other times I may write "I'll get back to this one" so that I can reflect on it as I don't always have an immediate answer. I have written all of this to encourage others to give this book a try. It is 365 days of thoughts and reflections that are not always comfortable to face, but I think it is worth it. I received my copy on the day it was released. 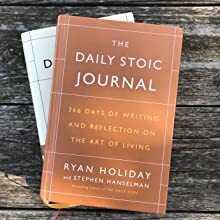 I've been using the Daily Stoic, the hardback, Kindle, and email editions, as a daily reflection about life and living a life of meaning. 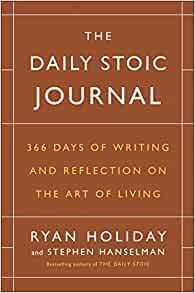 This Daily Stoic Journal is a daily guided journaling practice of preparation and reflection for each day broken down into weekly themes. I haven't begun using it yet as a journal, though I have read through much of it now in anticipation of putting it into use. Each of the weeks in the year is introduced with the theme and relevant quotes to illustrate and support the theme. Each day is prompted with a thought within the theme for both daily preparation and reflection. My only negative criticisms of the journal are it's size, which limits the amount of space for writing, and it's binding which doesn't easily lay flat. The binding is of good quality; I just hope it holds up to a year of use. The paper and print is of good quality and Ryan's and Stephen's efforts in breaking down Stoicism into 52 practices or disciplines with all of the supporting content and prompts is to be commended. 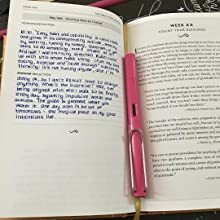 I have begun to use the journal daily and can see the path to true growth. Part of me wants to give a copy of this to every teen and young adult I know! Ryan, I have 2 practical suggestions. The lack of bulk of the journal is a plus, however it is too small and cramped for most people's handwriting...and given the fact that "millenials" et al have terrible script, it is challenging to add entries. I feel it should a) leave somewhat larger spaces for journal entries, and b) be in a lay-open format making it more inviting to write in. Update: I’m moving up to 5/5 despite my only issue. Didn’t feel fair that something small would drop a star. Obviously I just started using the book but I have browsed the entirety. It certainly looks as if it will serve a purpose over the course of the year. My only complaint...I wish the preset dates were removed. It would be much better to get started right away and have the first entry not be January 1st. 5.0 out of 5 starsTeach yourself life lessons by writing every day. I have written in a journal most of my life. In grade school, I called it my diary, listing my favorite things and the names of my friends and vacation spots. 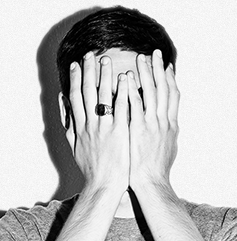 In high school, I wrote about my feelings (mostly who I was mad at or in love with). In college, my literature prof instructed us to keep a journal on our readings, a great way to interact with the text. After college, I wrote to try to make sense of my life: what I do, and more importantly, why I do what I do! My journal has become, in many ways, my best friend, my confidante, my therapist, my muse … my Voice. 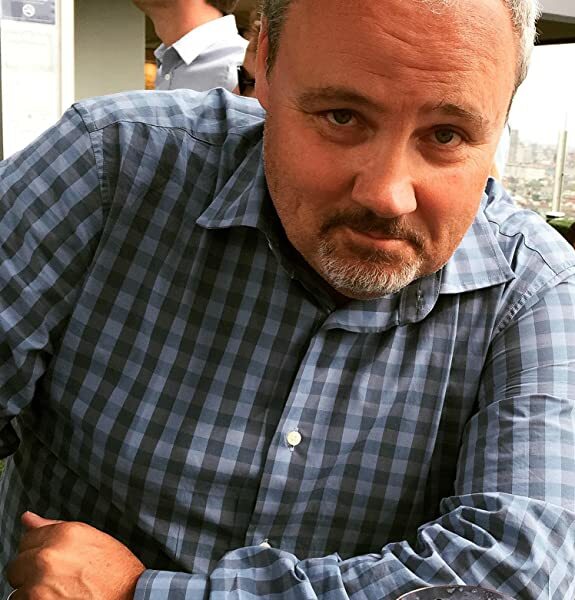 I’ve recently discovered journal prompts in online journal/blog communities, exploring a more structured and deliberate way of writing about my experiences. I've worked with these on and off for a little while now, but for some reason, nothing has really taken hold. The prompts are like "Describe the time when you first fell in love" or "What is the most valuable object you've inherited?" I mean, get it, they are meant to prompt you to just start writing with the idea that at some point, you will write about what's really important to you. But those prompts seem superficial and are often uninspiring. Because what is important to me is figuring out why I do/think/feel the way I do, how predictable those actions/thoughts/feelings are, how those actions/thoughts/feelings have changed over time, and how I should act and decide things right now and going forward. I have been reading The Daily Stoic this past year. 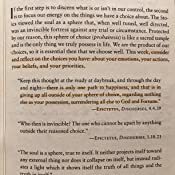 When I got the promotional material for The Daily Stoic Journal, and checked out the sample pages, I ordered it immediately. The few questions that I read in the sample resonated, and on November 19, upon receiving my book in the mail, responded to the question: "Will I accept the situation and still fight to do and be good?" I created a Word document on my laptop and named it "A Stoic Journal 2017-2018." I typed out the question and starting typing a response. In 20 minutes I had written just under 1000 words, describing a challenging period of my life when I felt I was being intimidated and accused of wrongdoing. I had written (complained) about this unwanted situation previously, but this prompt helped me to write about it in a focused way that made a lesson out of it for me, encouraging me to look for how I fought to do and be good in spite of being wrongfully accused. It helped me to accept what I had been through and that it actually was an opportunity to learn something new about myself and make me stronger. I have responded to the journal prompts in The Daily Stoic Journal almost every day since and it's my goal to continue throughout the year. If you are interested in learning more about yourself and the lessons that you can teach yourself through your own life experiences, I highly recommend this practice! 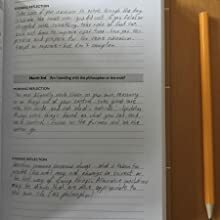 This journal is a great way to improve reflection daily on philosophical thoughts, stoic practices, and mental clarity. This journal along with the Daily Stoic email newsletter gives me the double espresso shot of wisdom I need to get through the day arriving at a better place. 5.0 out of 5 starsThis book can change your life. This book literally changed my life. I bought it on a whim hoping that I would find more focus in 2018. I found that really taking the time to consider these teachings each day and writing down my thoughts helped to put the in my brain for the rest of the day. So much so, that I started a daily podcast about Stoicism, and in working on these ideas everyday, I've changed the way that I look at the world. I handle emotionally stressful situations better, I'm not worried about the opinions of others since, and I focus on the one thing I can control, myself.